Gissur is named after a great chieftain of Sturlunga saga, Gissur ﬁorvaldsson, who was most famous – or rather infamous – for killing the poet Snorri Sturluson. His enemies tried to put an end to his life by burning down his farm at Flugum‡ri but he was clever and hid in a big barrel of sour whey while the less fortunate residents met their death in the fire. 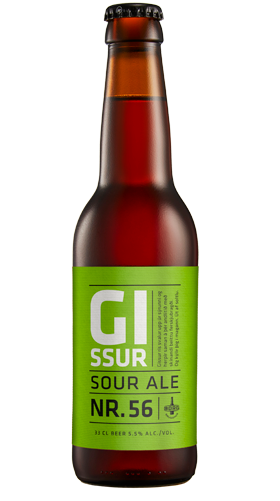 Gissur is a sharp lord of sour ale. When you are fired up Gissur will cool you down and save you or slave you, depending on his mood. He rises as a shining sour ale in the summertime and gives you the urge to knock back one more and even knock out a great poet. Don’t burn out, be Gissur’s friend and swim in the light sour ale with a taste of peaches glowing in the summer. You won’t be sorry with Gissur at your side. Ingredients: Water, malted barley, peaches, malted wheat, oats, lactose, hops and yeast.